Shares the Lone Star State&apos;s bloody fight for independence from the Mexican government and features the exploits of historical legends, Jim Bowie and Davy Crockett. Hale, Nathan, 1976-, author, illustrator. Revolutionary War spy, Nathan Hale, tells a hangman and British officer the story of the Donner Party, a doomed wagon train traveling from Illinois to California in 1846. Tells the story of the Marquis de Lafayette, both what happened before and during the American Revolution, including all the Frenchman&apos;s escapades across France and the colonies. "World War I set the tone for the 20th century and introduced a new type of warfare: global, mechanical, and brutal. 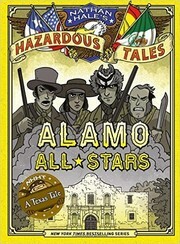 Nathan Hale has gathered some of the most fascinating true-life tales from the war and given them his inimitable Hazardous Tales twist. Easy to understand, funny, informative, and lively, this series is the best way to be introduced to some of the most well-known battles (and little-known secrets) of the infamous war"-- Provided by publisher. In a future where alien beings consume technology as a few humans try to preserve it, Strata, her brother, and a friend are separated from their caravan and, with a wonderful robotic horse, must fight their way back. Araminta Ross was born a slave in Delaware in the early 19th century. Slavery meant that her family could be ripped apart at any time, and that she could be put to work in dangerous places and for abusive people. But north of the Mason-Dixon line, slavery was illegal. If she could run away and make it north without being caught or killed, she&apos;d be free. Facing enormous danger, Araminta made it, and once free, she changed her name to Harriet Tubman. Tubman spent the rest of her life helping slaves run away like she did, every time taking her life in her hands.